The long awaited (well, not really, unless you sat there and counted the days) sequel to Zillion, Zillion II: The Triformation. Great, you're probably thinking, I've been looking to delve into the sequel to that masterpiece. Well, before you do, read this review as a bit of a warning, not a sign of imminent danger, but a little warning, just in case. You may been wondering why I'd semi-bash a game before I even begin to explain it, but there's a reason. I REALLY REALLY enjoyed Zillion. It's a great game, so one would expect its sequel to be at least almost as good, if not much better. Mind you, this isn't a BAD game, but it's nothing like the first one. In Zillion II the Norsa Empire is back terrifying everyone again. Apple and Champ, two of your buddies from the first one, went out to check out the new evil base and have not been heard from since. You, J.J., have naturally been called upon again to take the empire out and save your friends. To do so you've been given your Zillion laser, as well as the super-powered motorcycle, the Triformation. Unlike the first game, this one is entirely a run around and shoot crap game. In fact, the first part of each level is essentially in shooting format, with a typical platform run-around after it. That's it. Go a level on the bike, then go one running on foot, fight a boss, and it starts over again with the next level. Really not too much variety here. Again, it's not bad, it's just not what I expected. It's one of the games I remember playing at my neighbor's home, but he didn't have the first one. After I finally played that and saw how awesome it was, I popped this in again much to my dismay. 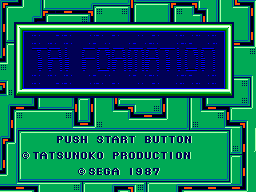 I was hoping for another run through a more complex labyrinth or something further along (with never got that far in it before), but instead was presented with a fairly basic platform/shooting game. Oh, well. Still, it's not really bad. 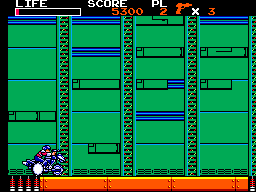 You can jump with the bike and shoot the hell out of everything, power up your laser (which actually doesn't get that powerful), get a special icon that can change the bike into a giant suit, and so forth. That's it really. The bosses are pretty sad generally, and you'll most likely destory them on the first try. It's the levels that are the hardest part as the controls are a bit shaky, plus there is sometimes no way to take everything out on the screen before you get hit. Now this part is good, a real step up from Zillion. They're nicely done. Good job. Much larger, and more complex overall with added details. Again, very good. The music is basically the same organization as what you'll find in Zillion, only it's been refined and made a bit more advanced, so to speak. Another good portion of this game, though. Here's another bad part. In Zillion, the controls were generally flawless. In this, not so much. Most of the time you'll get annoyed because the typical button operations have been reversed (like in Alex Kidd in Miracle World). Button 2 is to shoot and button 1 is to jump. So what, you are most likely thinking? Well, it's frustrating. The opposite set-up is simply the more natural way to have the controls programmed, it's just the way our hands work due to the way we positin our thumbs. In Alex Kidd, it didn't really matter because you normally had enough time to do what you needed to do. 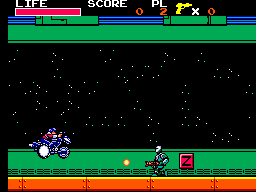 In Zillion II, enemies come from everywhere and shoot the crap out of you if you don't take them out. I can't tell you how many times I would have survived if the buttons were simply reversed. When you change into the robot suit, it doesn't matter at all since you don't have to jump anymore, but down in the hell of riding the bike is where it gets annoying. However, when you are on foot it doesn't matter at all, so that gives this game a little booster for an otherwise poorly done area. Really, as I said several times, it's not bad, and I will play it again, it's just disappointing to me considering how wonderful the first game was, especially compared to this. In conclusion, I'd have to say that Zillion II is a game to own, but not one to draw blood to locate. It's not that hard to find, and really not worth any extended effort to get your hands on it. It's a decent game, but pales in comparison to its predeccesor and provides you with just another shooting game to get annoyed with.